Fig. 1: Schematic of the test section. 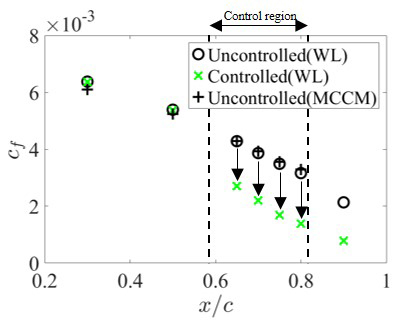 (b) Quantification using the wall law with pressure gradient(9). Fig. 4: Skin friction coefficients cf as a function of streamwise coordinate x. (1) 江藤 薫子，近藤 佑亮，深潟 康二，徳川 直子，「一様吹出し制御による翼面摩擦抵抗低減効果の実験的定量評価」，日本機械学会第96期流体工学部門講演会，室蘭，2018年11月29日-30日，Paper OS1-15 (2018). (2) 廣川 詩歩，江藤 薫子，近藤 佑亮，深潟 康二，徳川 直子，「受動吹出し制御による翼面摩擦抵抗低減の風洞実験」，日本機械学会流体工学部門ニューズレター「流れ」，2019年3月号，Article No. 4 (2019). (3) Abbas, A., De Vicente, J., and Valero, E., “Aerodynamic technologies to improve aircraft performance,” Aerospace Science and Technology, Vol. 28, pp. 100–132 (2013). 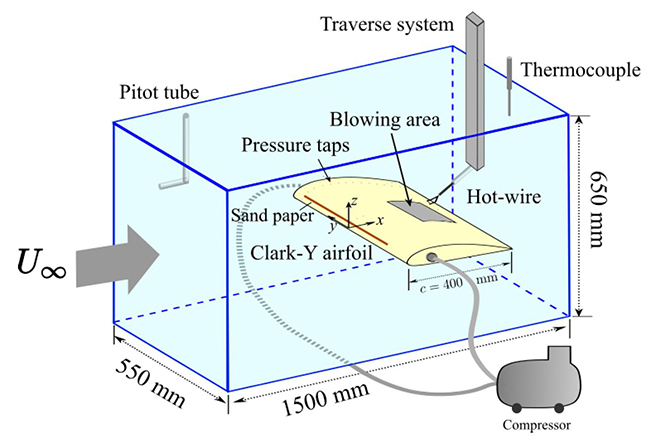 (4) Park, J., and Choi, H., “Effects of uniform blowing or suction from a spanwise slot on a turbulent boundary layer flow,” Physics of Fluids, Vol. 11, pp. 3095–3105 (1999). (5) Kametani, Y., and Fukagata, K., “Direct numerical simulation of spatially developing turbulent boundary layers with uniform blowing or suction,” Journal of Fluid Mechanics, Vol. 681, pp. 154–172 (2011). (6) Kondo, Y., and Fukagata, K., “Friction drag reduction of a spatially developing boundary layer with pressure gradient by uniform blowing and suction,” 11th European Fluid Mechanics Conference, Seville, Spain, Sept. 12-16, 2016 (2016). (7) Dixit, S. A., and Ramesh, O. N., “Determination of skin friction in strong pressure-gradient equilibrium and near-equilibrium turbulent boundary layers,” Experiments in Fluids, Vol. 47, pp. 1045–1058 (2009). (8) Vigdorovich, I., “A law of the wall for turbulent boundary layers with suction: Stevenson’s formula revisited,” Physics of Fluids, Vol. 28, 085102 (2016). (9) Nickels, T. B., “Inner scaling for wall-bounded flows subject to large pressure gradients,” Journal of Fluid Mechanics, Vol. 521, pp. 217–239 (2004).